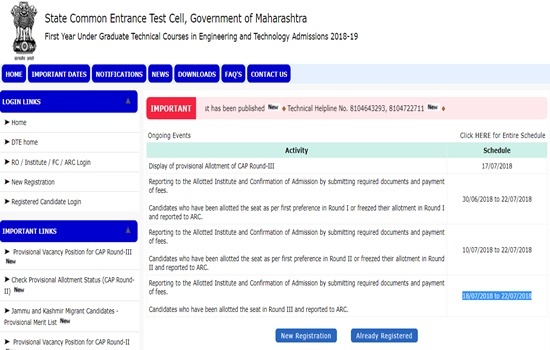 MHT CET Third Seat Allotment Results 2018: Directorate of Technical Education Maharashtra will be declared the MHT CET 3rd round Provisional CAP seat allotment results 2018 on its official website i.e dtemaharashtra.gov.in today on july 17th. aspirants waiting curiously for the MHT CET seat allotment results can visit the official portal and check the result. On 17th July, Monday the DTE is to release the 3rd round seat allotment results for BE/B.Tech courses. Without much delay, candidates can proceed to check the MHT CET 3rd round seat allotment result for BE/B.Tech admissions. Candidates allotted seat in the 3rd round will have to report at the Admission Reporting Center (ARC) from 18/07/2018 to 22/07/2018. And the aspirants will have to pay the requisite admission fee and report at the allotted colleges between -. Candidates who gained the admission in 2nd round seat allotment process will have to follow the process of admissions. Check the important dates and other details from the following. Maharashtra Common Entrance Test will be conducted by DTE Maharashtra in Maharashtra state annually. The board gives the admission to first year of full time degree courses of health sciences (MBBS, BDS, BAMS, BHMS, BUMS, BPTH, Both, BASLP, BP & O and B.Sc, Nursing, B.V.Sc. & AH and also it gives the admissions in technical education Engineering and Technology such as B.Tech/BE, B.Pharmacy and Pharma . D. This year lakhs of aspirants seeking admissions in professional graduate degree in various courses have applied for the MH CET examination. The MHT CET examination was successfully completed by DTE on 10th May. Lakhs of hopefuls seeking admission in various Graduate Degree courses have appeared for the MHT CET examination. The MHT CET examination was held across Maharashtra state in many examination centers. The MHT CET results were declared by DTE 3rd June and the provisional merit list was released on 21st June. The DTE Maharashtra has scheduled the CAP Category wise 2nd round allotment on 9th July. Candidates can check Maharashtra CET 3rd round seat allotment results 2018 category wise from today. Visit Dtemaharashtra.gov.in to check the results. Once clearly check the admission dates from the following table. On the homepage, click on MHT CET 3rd Round seat allotment result 2018. And make a printout of the Maharashtra BE/B.Tech seat allotment order to report at the allotted college.